Standing in the beauty of a sunny, crispy blue sky on a warm late Spring 2017 morning, I am reminded – as I look at the massive architectural art structure of the Mayor David N. Dinkins landmark building located at 1 Centre here in New York City across from City Hall; the irony of our purpose came into full focus. 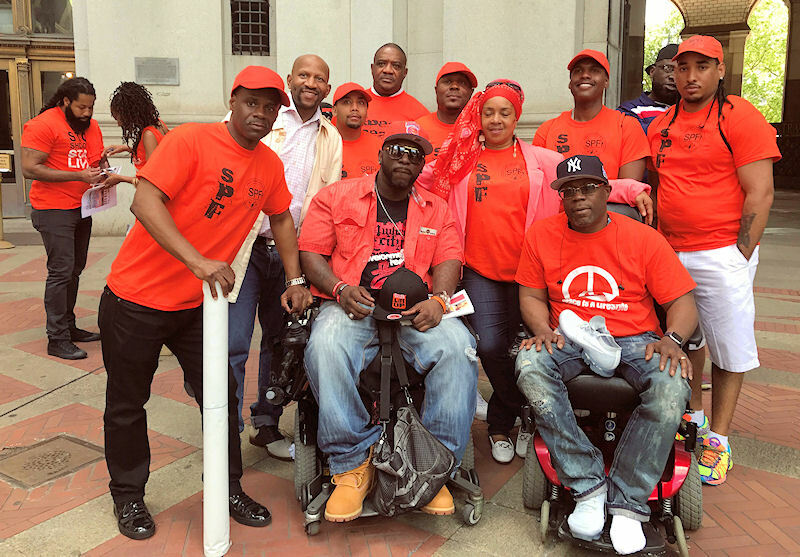 Wheel Chairs Against Guns (WAG) was on deck with local politicians, community activists and other organizations, to help launch National Gun Violence Awareness Month. WAG participates in a daily fight to proactively save the lives of inner city youth and continuously advocates for more resources to combat the underlying social economic conditions, which create the mindset that leads to gun violence. The financial cost of gun violence in the United States was an estimated 174 billion dollars in 2010; this amount does not account for the psychological toll on those directly or indirectly affected by firearm violence, such as those who witness or fear firearm violence in their homes or communities. There are more than 30,000 firearm fatalities each year in the United States and more than 80,000 non-fatal injuries requiring emergency medical care or hospitalization. In 2013, there were 33,804 firearm deaths in the U.S., and more than 84,000 non-fatal firearm injuries. 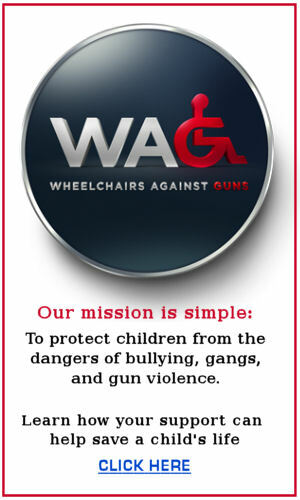 This is why Wheelchairs Against Gun (WAG), founder Kareem Nelson – who was paralyzed as the result of a gunshot wound, and I were on deck to support Gun Violence Awareness Month. The “Wear Color Orange” aspect began several years ago, when senseless gun violence in Chicago led to the death of a teen honor student, Hadiya Pendleton – who one week prior performed with her marching band at President Obama’s second term inauguration celebration festivities in Washington DC, sparked a national outrage. A sea of orange clad supporters surrounded guest the speakers on this sunny day. Some shared personal stories of how their lives were affected in the aftermath of losing loved ones. Some, were now confined to wheelchairs and others who loss multiple family members, gave chilling accounts of their ordeal. We have to admire the resolve it takes to deal with ripple effects associated with heartbreaking life altering change. WAG seeks to break the cycle of gun violence. Part of the problem is that those who have the financial means, simply don’t take action. People talk a good game. We see many pundits on the talk show circuit, and this is not to knock them. They represent a part of the solution, which to initiate dialogue, but we simply need more action at this point. Attacking the problem with a proactive approach has deep positive impact beyond reducing violence. WAG empowers young people with problem resolution skill sets that can last a lifetime. The lessons learned enable troubled teens to see the bigger picture and realize the long-term implications associated with criminal activities. To do this work WAG (which is a non-profit organization), requires the proper resources and funding. If you don’t have the time to physically do the work of engaging with, supporting and empowering young people regularly, please visit the WAG website and make a contribution on a regular basis. Be it weekly, monthly, quarterly or annually, your dollars – which are tax deductible, will go towards a good cause, the work of saving young lives and building a better future. CLICK HERE to show your support for our noble cause!